This post was originally published on March 5, 2016. Wallpaper can be used to create a very personal space, one reflecting the style and/or temperament of its creator, or possibly to inspire the desired mood. The myriad wallpapers in production at any given time range from ultra-minimal and loose, to dense pattern-rich designs. 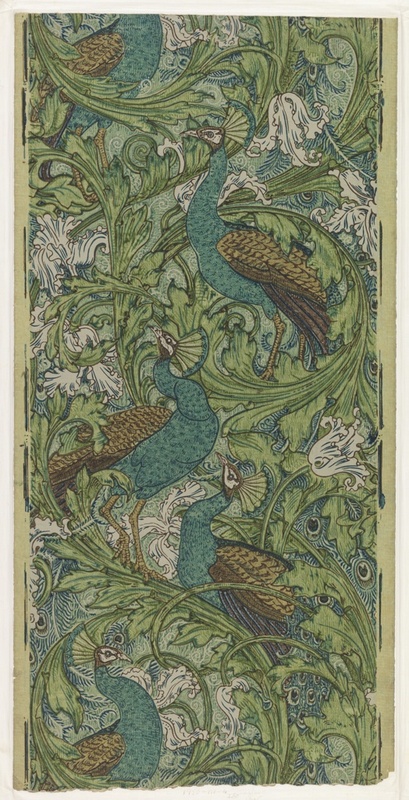 Peacock Garden, a beautiful design of flora and fauna by Walter Crane, is one such paper from the latter extreme. Combining regal peacocks with lush and very dense tulips and acanthus leaves, it is printed in rich jewel-tone colors of blues and greens that impart a very calming, comforting influence. While there is a shallow plane created by the layering of the peacocks, tulips, acanthus leaves, and the mottled blue background, the paper would not visually enlarge a room like a landscape paper, but would rather enclose and envelop adding a further layer of comfort. One of the benefits of block printing is the ability to have a large repeat, which in this design amounts to the length of four peacocks. The technique of wood block printing creates a suction when the block is lifted off the paper which causes the pigment to pool in different directions, further adding to the organic nature of the design. Walter Crane was quite the prolific designer, working in mural decoration, stained glass and metal work, ceramic tiles and pottery, as well as wallpapers and textiles. He was also a well-known children’s book illustrator, and became the first renowned artist to design children’s wallpaper. A number of Crane’s children’s books can be viewed in the Smithsonian Design Library, located at Cooper Hewitt. Gregory Herringshaw is the Assistant Curator in the Wallcoverings Department. Now this is a wallpaper that ought to be reproduced – if that is there’s a large enough audience left today to appreciate it. A marvelous submittal from you, and I for one definitely appreciate being exposed to the pattern. And thanks too for some details on Walter Crane; a once influential designer sadly forgotten in our rushed world of short attention.